LOCATION.--Lat 42°06'32", long 74°27'07" referenced to North American Datum of 1983, Ulster County, NY, Hydrologic Unit 02020006, on left bank 10 ft west of State Highway 28, and 0.1 mi upstream from bridge on Lasher Road, at Big Indian. GAGE.--Water-stage recorder and crest-stage gage. Datum of gage is 1,227.42 ft above NAVD of 1988. REMARKS.--Seasonal diversion for snowmaking by Belleayre Mountain Ski Center at Pine Hill. Occasional regulation by Pine Hill Lake 1.7 mi upstream, and low flows may be affected by Pine Hill Wastewater Treatment Plant about 1.1 mi upstream. 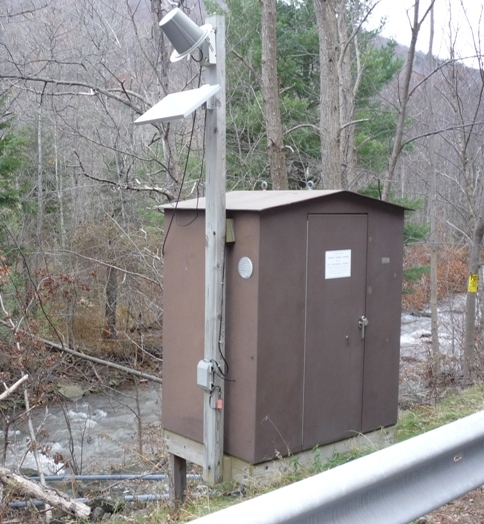 EXTREMES FOR PERIOD OF RECORD.--Maximum discharge, 1,460 ft³/s, Aug. 28, 2011, gage height, 7.18 ft, outside gage height was 7.58 ft, from crest-stage gage, from rating curve extended above 260 ft³/s on basis of slope-area measurement of peak flow; minimum discharge, 1.6 ft³/s, Sept. 26, 2008; minimum gage height, 2.17 ft, Sept. 25, 26, 2010.